Its Thursday 21st April 2011 and its been raining for three days, our back garden has had 24cm, 23cm and 19cm, Harley tells me there has been more further north at Cooroy. Great as Cooroy is close to where we are about to go canoeing and camping for five days backwoods style, unsupported with constant rain, on top of all the recent rain we means the river could be at an interesting level. We are definitely nervous about it as we have had our trips canceled before because of the rain and we have all been extremely excited about this trip. The fishing trip is in the Upper Noosa in the Cooloola section of the Great Sandy National Park in Queensland. Alison has prepared us for it for days, she is always the quarter master and does an exceptional job at organising the food and gear. We’ packed the Nissan Patrol the night before. Even with that we were up at 3am to get ready; we had agreed to meet the girls at 5:30am at the Etamoga Pub. The plan is to grab a pie for breakfast from “Beefys”, the only place open at that time in the morning before heading on our way in a convoy of two. Charlies brave little Rocky, the Korean wannabe Jeep and our Nissan Patrol, now sporting the new expanded roof racks so we can carry two 15 foot Indian style canoes at once. Our journey down the winding narrow 30 kilometres road to that leads past Kin Kin to the four-wheel drive track to Harry’s hut nearly ended in disaster before we started. There in front of me, was a calf; it had just jumped from the side of the road right in front of my vehicle. I threw out the anchors as we narrowly avoided making it road kill, that would have been a disaster. The dirt and sand track down to the river was very wet and there were puddles all the way, I was carefully going around them, I noticed that Charlie and Harley were ploughing through them spraying water and mud everywhere. They were having fun already. The road is down hill and finishes on some flats about a kilometre from the main Harry’s hut camp ground and as we got down to the flats, the road turned into a river. Water was flowing all down and across the road, for as far as we could see, it was difficult to see where the road was for the water. We weren’t sure if this was as far as we were going to get, I had no idea how much water was on the road and I knew there were creeks with bridges and those bridges were just boards across the water, no sides on them, you had to hit them exactly or you ended up in the water either side and that would not have been nice. At this point Alison walked in front of the vehicles to check the depth of the water and to see if there were any holes. It was a bit like the man with the red flag. The water turned out not too bad and apart from making this part of journey a bit exciting and slower than we had intended, we negotiated it all okay. 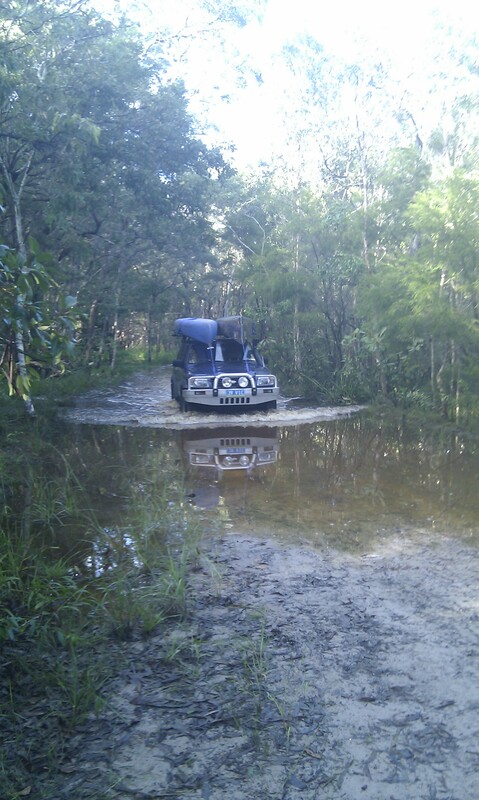 The Noosa River was very high, we had never seen it like this before, the jettys that are along the camp grounds for sightseeing boating and for loading canoes were completely underwater. 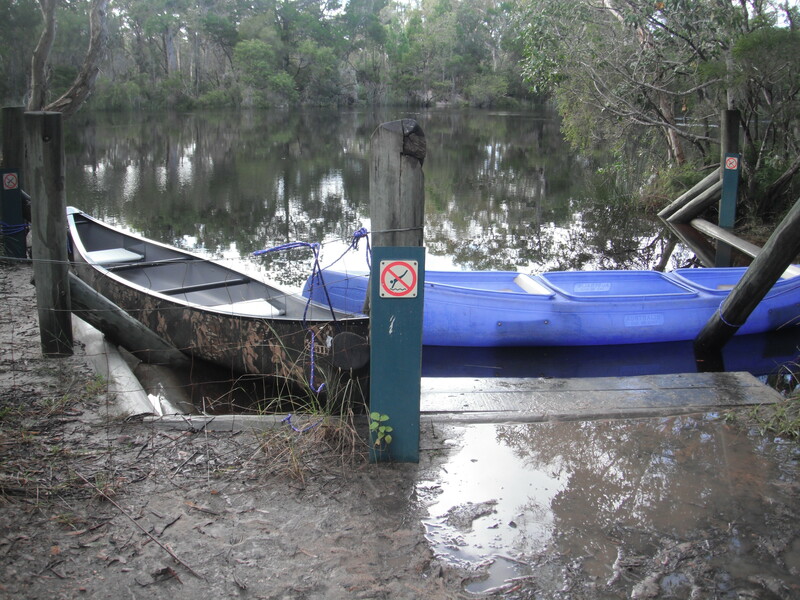 The Parks department had closed the main canoe loading area and we had to use an area marked for groups. speaking to a guy who had arrived the night before we learnt that he and his son had paddled straight over the grass to the camp site from the river, and that the river had actually gone down considerably over night. The river is in flood this, a very interesting paddle lay before us. 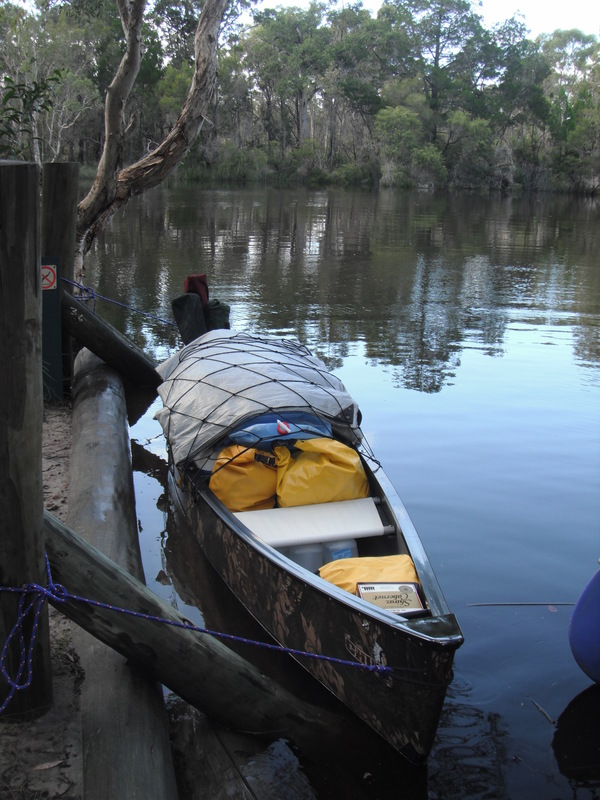 With the water so high that loading the canoes with six days worth of gear including 15 litres of wine, six dozen beer and tables and chairs was not too difficult although a little stressful wondering if we would fit it all in. Charlie in her Black and red flanny “Red Neck” cap, and me in my Acrubra, our canoes stacked high with gear and food we looked like rejects from the Deliverance movie. We pushed up the river for three hours before exhausted, we came to our camp site. 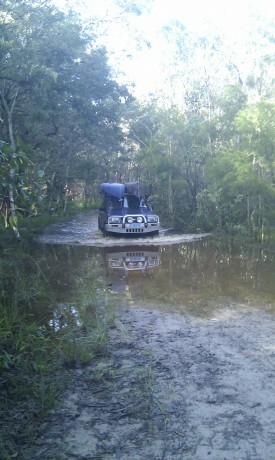 The entrance flooded and we had to bush bash an alternative route to tent site high above the water. Pleased when the tents finally went up and we could sit around and have a plastic glass of wine and dinner. The girls had a half-hearted effort at fishing but we were too tired to give it a good go.